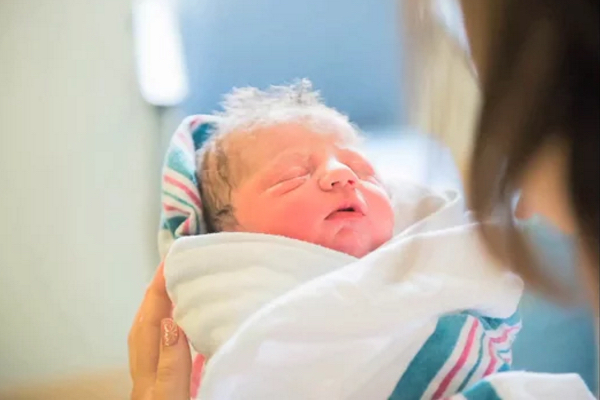 I wasn’t expecting to go into labour when I did, in fact I was pretty positive that I was going to be pregnant forever—or at least until my due date. The morning of June 3 I had an appointment with Nicole, my midwife. We talked about labour and when I should be calling, as well as my worries and expectations for what I’d like to happen this time. She checked me, and I was 2 cm dilated. I knew not to get my hopes up about going into labour since I knew I could be walking around at 2 cm for another couple of weeks. I carried on with my day, went shopping and out for lunch with Rob and enjoyed what would be our last all-you-can-eat sushi lunch before baby arrived! Nothing felt out of the ordinary later on during the day, aside from the normal Braxton Hicks (tightenings) I had all throughout my pregnancy. That evening I noticed I had started to have what felt like just mild cramping, but I chalked it up to being checked that day and went to bed around 11 after having a nice hot bath. I had done more preparation this time around, read a lot about natural childbirth, as I wanted my birth experience to be different this time. I knew my body was made and capable of birthing this baby, and I wanted to trust in what my body knew how to do. I had talked at length about this with my support person Kahley, as well as with Rob and Nicole. Everyone who would be at this baby’s birth knew what I wanted, and how I wanted to welcome this baby into the world as naturally as possible. That night I woke up around 1 am from the “cramping” which was now more intense. I decided to text Kahley and get her thoughts. I was so unsure of whether this was labour so I started timing these cramps. 6 minutes apart and consistent. After about a half hour or so of this, I decided to wake Rob and let him know what was going on. He took over timing things and the contractions had picked up to every 3 minutes. It wasn’t long before Rob was urging me to call my midwife, as contractions were now 2 minutes apart and lasting for a minute or longer each time. I had the crazy thought that by getting in the tub might somehow slow things down which it did NOT and I quickly abandoned that idea due to the intense pain I had when sitting still for any length of time. I called Nicole and we decided she’d come to the house and check me here and we would decide from there what we were going to do. Nicole arrived at around 5 am, checked me and I was 8 cm dilated and 100% effaced!!!! Contractions at this point were very uncomfortable and I was doing a lot of moaning, groaning and moving to try and cope with the pain. I was so loud at one point when trying to get through a contraction I think I woke Owen up! We decided that if we wanted a hospital birth we would need to go NOW. Since we live out in the country, Nicole wasn’t sure we would even make it to the hospital and told us that if I started to push, to head to St. Jacobs where the office was and I could deliver there. The car ride to the hospital was, to put it nicely, torture. I was experiencing back labour that was so intense, the only relief I got was via counter pressure. I don’t even know how I made it there but we did and Rob quickly wheeled me up to labour and delivery because this baby was coming!!! I had planned to have Rob, Kahley, my midwives and our birth photographer, Calla, present during labour and delivery and both Calla and Kahley arrived soon after I did. Having Kahley there was such a help to me as I knew, she KNEW what this was like. She understood. She wasn’t there to be medical, she was there to just support me and cry with me and just be. Rob was by my side the whole way too. I leaned on him through every contraction and I knew he felt so totally helpless watching me try and cope with so much pain. I laboured on my feet, swaying, squatting, moving with the rhythm of each contraction as best I could. I was loud. I felt like my entire body just was taking over and I could do little to stop it. My water broke while standing up, all over Rob and Kahley’s feet! Once my water broke, the contractions intensified and became almost unbearable. One on top of each other. Over and over. There was no break. This was the hardest for me. I remember Nicole checking me again and saying that it was time to push. And so I started pushing. With each push I felt like nothing was happening – that he wasn’t moving. I tried every position they wanted me to try; I squatted on the bed, I went on all fours, I used a birthing bar to try and push him out. I was exhausted. I remember getting to a point where I couldn’t even physically lift my body up onto the bed anymore. I was done. I remember pleading for help, telling Nicole I couldn’t do this anymore – begging for any kind of pain relief. I was told that they would get the ball rolling for an epidural. They started an IV. I remember just being draped over the head of the bed and pushing so hard. I remember Kahley praying. I don’t know what she said or at what point she did this but I know I reached down and could feel my baby’s head. I can’t even describe how I felt in this moment – defeated, exhausted, like maybe I really couldn’t do this. I was scared after all this labour, all this energy, all this pain that I wouldn’t get to birth my baby how I wanted. That’s when I started using the mirror. Once I could see that each push was gradually bringing my baby closer to me I felt like I could maybe do this. I pushed and pushed with everything I had. I felt like my head was going to explode!! The sheer relief I felt when his sweet little head finally emerged was amazing. All that pressure and pain was instantly gone. One more push and I reached down with Rob’s hands next to mine and we pulled our son up onto my chest!!!! I was in total disbelief that I had just done that. That I had accomplished what I felt was impossible to do. The emotion that fills you when you see your baby for the first time and realize that you just did what you thought was impossible to do was so intense. An incredible high. All that pain, thoughts of “I can’t” instantly vanish and you are filled with nothing but love and joy. Hearing his cry, seeing his beautiful head covered in thick dark hair, and gazing into eyes that had seen nothing but me is an honour – one that wasn’t lost on me in that moment, and one that I still think about now. It was hard. It was intense. There were moments where I thought I couldn’t. But I did. I gave birth, naturally, surrounded by so much love and support, to a beautiful healthy baby boy.